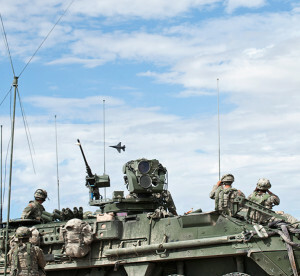 Soldiers from the 1st Armored Division’s 1st Stryker Brigade Combat Team out of Fort Bliss, Texas, look on as an F-16 Fighting Falcon executes a show of force in the skies over the National Training Center Range, Fort Irwin, Calif., during a Green Flag 15-08 training scenario June 12, 2015. In many situations, an aircraft executing a low pass over a conflict zone can act as a deterrent to potential enemy combatants. Nevada’s Nellis Air Force Base plans to restructure the 57th Operations Group to enhance its focus on close air support integration, Air Force officials announced Aug. 16. 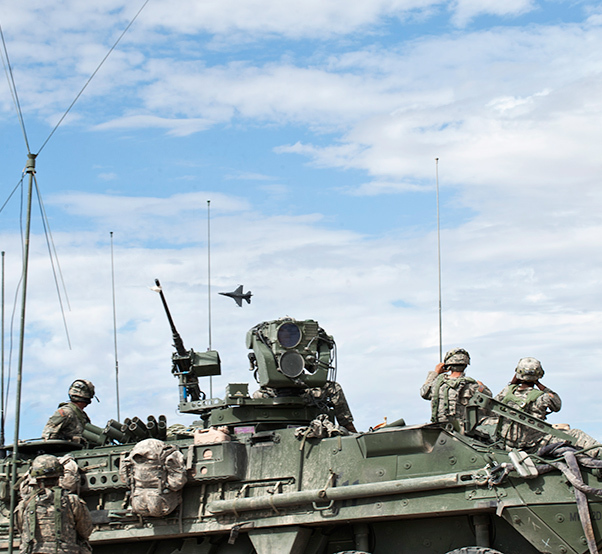 The group’s mission will include high-end fight training as well as an increased emphasis on tactical-level close air support with experts to integrate fires in joint operations, advancing the joint CAS enterprise and preserving the Air Force’s CAS culture. In March 2015, ACC hosted a Future Close Air Support Focus Week, which brought together joint experts and leaders to assess the current state of the CAS mission, discuss future challenges and requirements, and determine items for further study to ensure the effectiveness of this critical mission. One of the recommendations from the forum included standing up a CAS-dedicated organization to help preserve what has been a highly effective CAS culture and help meet the close air support challenges of tomorrow. The Air Force intends for the 57th OG to include the CAS-dedicated organization with a tactical air support squadron, which would provide dedicated air support to the Joint Terminal Attack Controller Qualification Course, USAF Weapons School, and Green Flag and Red Flag exercises capitalizing on the existing CAS expertise and schoolhouses currently at Nellis AFB. The tactical air support squadron would initially consist of eight permanent F-16 Fighting Falcons to be relocated from Hill AFB, Utah, with potential for expansion to a total of 16 at full operational capability. In addition to the newly assigned F-16s, the 57th OG will also leverage geographically separated contract light aircraft as cost-effective augmentation to enhance JTAC training with Air Force fighter aircraft. The Air Force has already begun to evaluate the effect of basing the additional F-16s at Nellis AFB. Final Air Force decisions will be made regarding the new squadron upon completion of the environmental impact analysis process. Upon reaching full operational capability, the 57th Wing at Nellis AFB will conduct all graduate-level CAS training as well as operational training for the forward air control mission. The wing currently conducts the JTAC weapon’s instructor course, the air liaison officer qualifying course, and Green Flag, the Air Force’s series of premier air-to-ground training exercises. 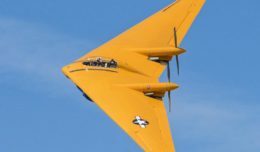 “The 57th Operations Group is uniquely positioned to become the Air Force’s center of excellence for close air support training,” said Jennifer Miller, the deputy assistant Air Force secretary for installations. The 57th OG educates, exercises, and advocates the integration of airpower into the joint fight and supports the preparation of the combat air forces’ maintainers and aircrews. To execute its mission, the group oversees operations of six squadrons and three detachments from Nellis AFB and four geographically separated locations.